Well! That would indeed be a first! Ours is an industry where Photoshop is a fully-endorsed art form for celebrity images – in fact, with past professional experience I can assure you that most celebs wouldn’t let an untouched image ever make it into print! Upper arms, chest, waist, legs, complexion… few are ever as perfectly flawless as their post-production images. However, skin lightening remains a touchy subject in India, where dark skin is traditionally identified with the toil and sweat of hard labour, while fair skin is associated with a genteel, upscale lifestyle. Thus, the Indian skin whitening market continues to be valued at over Rs. 1,200 crore and growing at 10-15 per cent per annum. And that’s not all. Millions of women actually do their skin more harm than good by falling for dubious procedures and damaging ingredients that can lead to severe skin irritation, allergic reactions like dermatitis, burning, stinging, itchiness, redness and permanent scarring. Yet other reported side effects include eye problems like conjunctivitis, shortness of breath, respiratory problems and a high cancer risk. The last few years have brought about rays of hope with the growing visibility of dusky supermodels and actresses like Bipasha Basu and Priyanka Chopra imbuing the not-so-fair complexion with unprecedented glamour. And that’s why airbrushing leading celebs into snowy whiteness seems so unnecessary and counter-productive. Does someone like Aishwarya Rai really need to be milky-white in order to be “beautiful”? Are we still chasing the ever-elusive dream of white-is-good? Is it ok to reinforce an alabaster white skin tone as the accepted standard for true beauty? Or should we be encouraging today’s women to be comfortable in their own skin, literally? 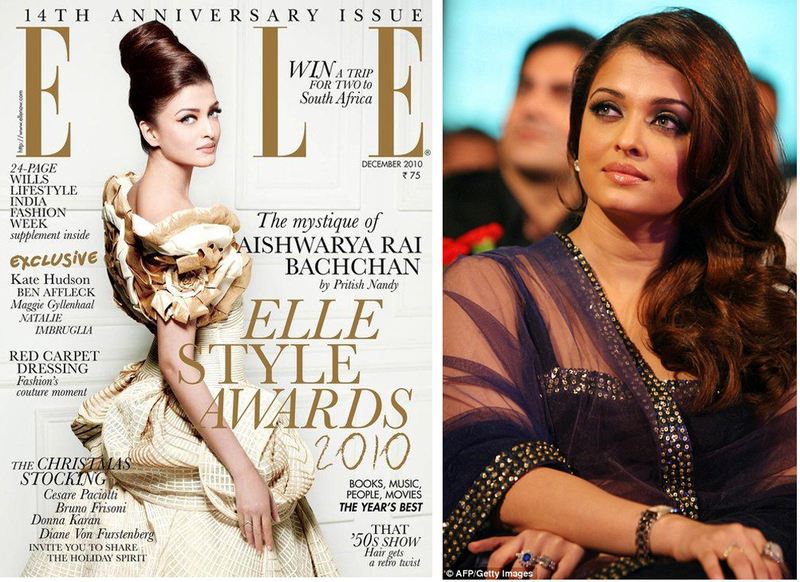 And then there are the other questions: Will Aish really sue (personally, I wouldn’t hold my breath!)? Did Elle actually whiten the images? Will other celebs, fans and industry-watchers finally start sitting up and protesting against the digital manipulation of any and every body part in celebrity and fashion images? Time is going to answer these ones but I am happy that the ripples have at least started spreading towards a more healthy consciousness of what’s real and what’s not and whether real beauty demands such scalpel-like perfection.